Food waste upsets me, but it is inevitable with our “juggling act” schedules; and meal planning sometimes takes a back burner, per say. I dress my dishes with a variety of fresh herbs, but their shelf life isn’t as strong as their flavor. (if only I had out door space for a garden). 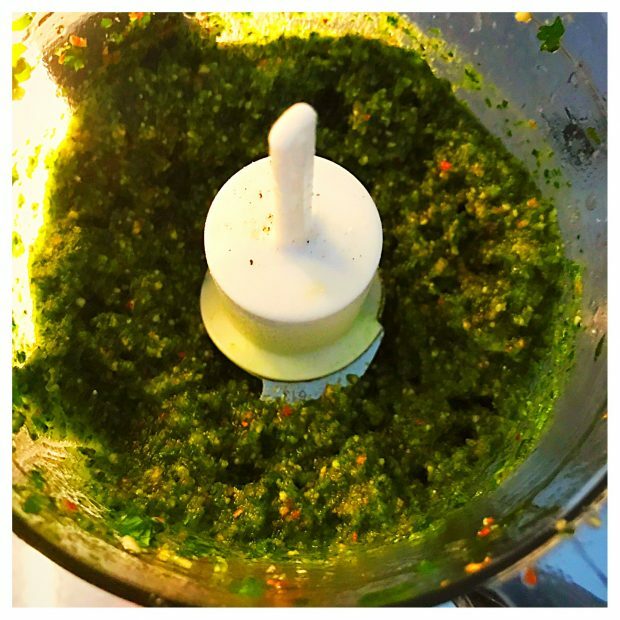 Whipping up a simple pesto is a tasty and practical way to lessen fresh herb waste. Pesto also lasts several weeks in an air tight container. Bonus: you can incorporate the pesto into fish and meat, eggs and pasta dishes for quick weeknight meals. Add the nuts to a small blender or food processor. Crush them. Then, add the herbs and some oil. Allow that to blend. Add more oil until it is at a desired consistency. Add cheese. Season with S & P. Taste and adjust with additional, seasoning, oil and cheese. Another culprit is the trusty, or should I say fickle shroom. The button or crimini mushroom start off dry and earthy in texture and taste but can quickly transform into soggy and wet specimens. Sauté them up and use the extra mixture for future eggs, pasta, and salad meals. With a medium to large sauté pan, heat pan, allow to get hot before adding oil. Then pour oil in and add onions. On medium heat, allow onions to cook for a few minutes, then season with S & P. Add garlic, stir occasionally and watch to ensure that you do not burn the garlic. When translucent and slight caramelized, remove from heat and set aside in a bowl. While pan is still hot, add a touch of oil, and add mushrooms in a single layer. If they don’t fit, cook in batches. Do not play with them too much, you want mushrooms to brown and gain extra earthy flavor. 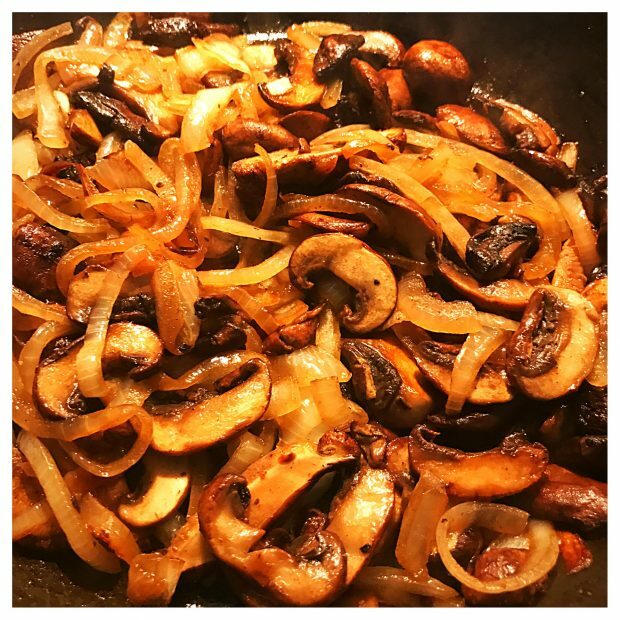 Season with S & P. Add onions back in with the mushrooms. Splash it with the sherry and let alcohol cook down. Add butter, let melt and mix. Squeeze lemon juice. Taste and adjust the seasoning. If you have been reading the BE blog, when you know I rarely follow recipes. So when I invited a friend over for a late afternoon brunch on a rainy Saturday; I had the mind set of making a delicious meal with ingredients that I had in my refrigerator. Bring a medium to large sauce pan of water to a boil. Add several tablespoons of Kosher salt. Cook preferred pasta as directed. Reserve some of the salty starchy pasta water in a mug to the side when draining pasta. Return pasta to warm sauce pan. 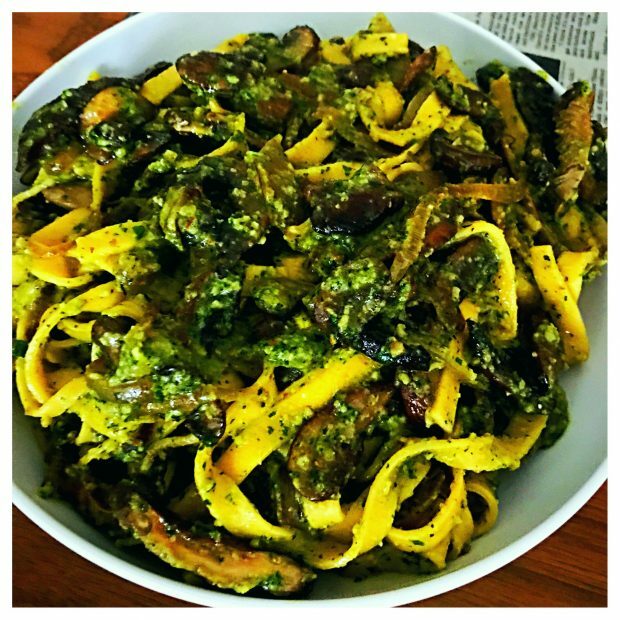 Stir in several tablespoons of the pesto and the mushroom mixture. Add some pasta water to loosen and marry ingredients together. Plate in a large serving bowl. This dish can be enjoyed warm or at room temperature. Bon Appetit! If you are interested in more helpful tips in the kitchen, sign up to receive the blogs conveniently right to your inbox. I encourage ingredient and blog requests. Just add a comment below. Stay hungry!